Spring is here! Time for salads and fun. Spring is here! No really, I mean it. OK, so the northeast might still have snow and the south is already sweating, but hey– it’s April– and no one can deny that. We had friends over on Saturday night and all I wanted was an easy dinner of finger foods, fun, and friends. Let’s be honest– the first supplies I bought for dinner were the cold liquor and the marshmallows for smores. I started with an antipasto platter of olives, cheese, summer sausage, and stuffed grape leaves, because that pretty much took five minutes to make. But I wanted a light salad that would be filling and knew that I needed to sneak some protein in there. So I decided to try lentils in the crock pot as a perfect spring salad topping. I’ve never made them before, so I did a little reading online. I learned that vegetarians love lentils (no surprise) but that I should never-ever-de-ever put salt in the water when I am cooking them (good to know!). I also read that you don’t want lentils to get mushy, so I committed to cooking them on high instead of low. 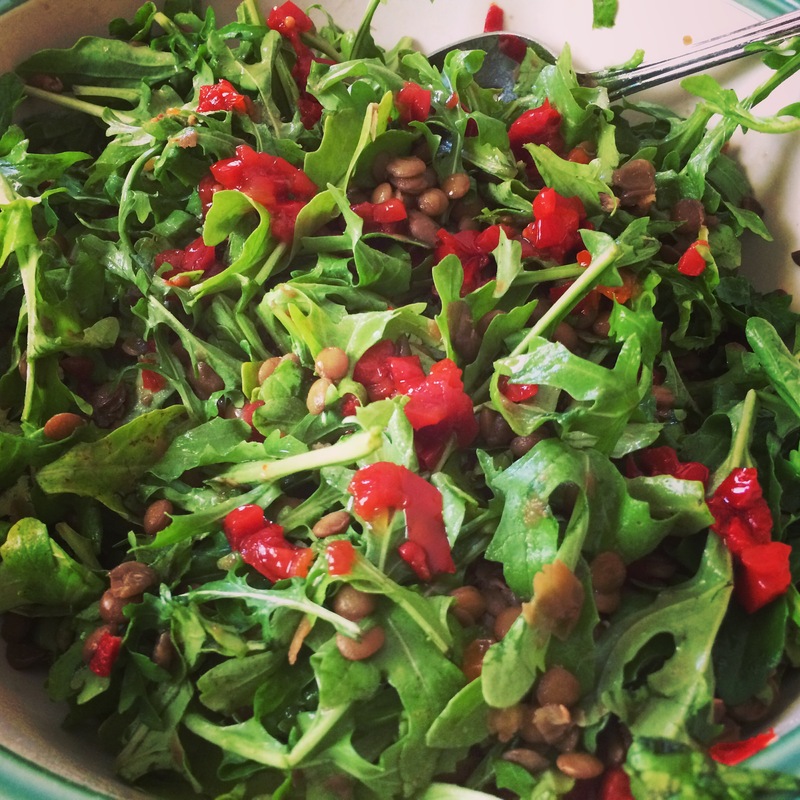 Lentils are easy to cook and can be used in so many ways! 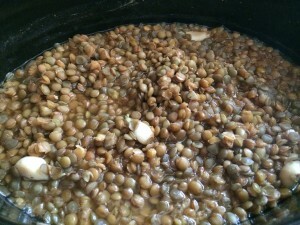 Lentils turned out to be ridiculously easy in the crock pot. First off, follow the directions about sifting through the lentils for stones or dirt or whatever hippies don’t actually like to eat in their plant-based superfoods. Then, use a ratio of about one cup lentils to three cups water. You will have lots of excess water in the crockpot when the lentils are done, but you can easily use a slotted spoon to scoop the lentils out when they are done swimming. I watched the crock pot a little more closely than I normally do because I really didn’t want the lentils to be overdone. I had set it for 4 hours on high, but at about 3 hours, they were done. Next time, I’ll know to set it for 3 hours and I can go about my business. This is what having a relationship with your crock pot is all about, but sometimes the trust has to be earned. That’s it– perfect protein-packed superfood ready to top my spring salad. So I started with arugula. Added the strained lentils. Topped it with a little bit of sweet pepper relish (you could use regular fresh red peppers if you prefer. For the dressing, I mixed together some fig balsamic vinegar with some herb-infused olive oil. If you have an olive oil store near you, it is totally worth getting these fun flavors and using them to make really easy dressings. Enjoy spring, people! Enjoy a fresh salad, a refreshing adult beverage, and some toasted marshmallows for dessert. 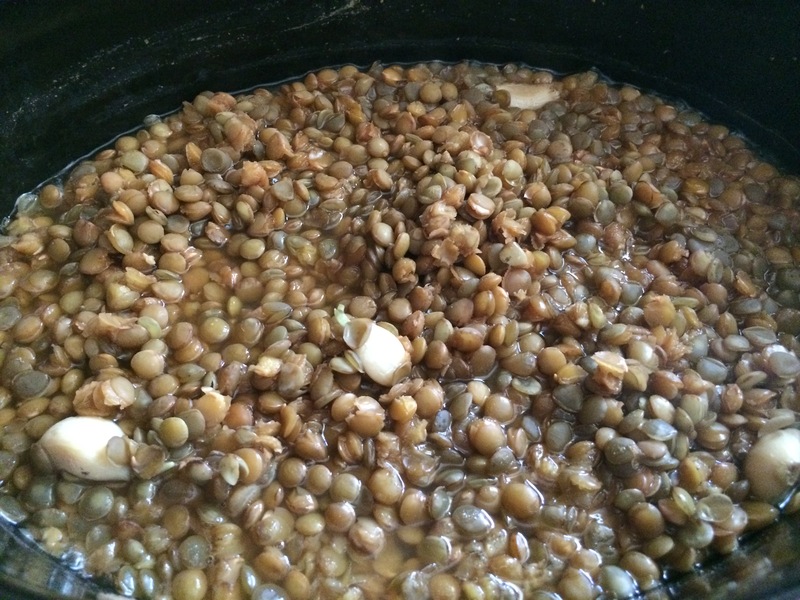 Put lentils, garlic and water in the crock pot for 3 hrs on high. Use a slotted spoon to remove all lentils. Top arugula with lentils, red pepper, and toss with dressing. Enjoy!